In RDKs, a certain percentage of dots are designated as “signal” to move in one coherent direction, and the remaining percentage of dots are designated as “noise” to move in random directions. However, as noted by , several options exist regarding how signal and noise can be drawn in frame-by-frame presentations. To create the “signal,” dots can either move in the direction of coherent motion in all frames (referred to as the “same” rule), or move in the direction of coherent motion in only a specified proportion of frames (referred to as the “different” rule). To create the “noise,” dots can either be drawn in a random position in the aperture on each frame (“random position”), move to an adjacent position in a random direction in each frame (“random walk”), or have a consistent direction of motion, designated randomly at the beginning of the trial (“random direction”). Modelling our stimulus after the random-dot kinematogram from the software PsychoPy [7, 8], we parameterized these different combinations of signal and noise to yield six different display options. Additionally, dots in RDKs have a “dot lifespan,” which determines the number of frames that pass before a dot disappears and reappears somewhere else within the aperture. However, if a dot reaches the end of the aperture and its dot lifespan has not ended, then a dot can either reappear randomly in the aperture, or be reinserted from an opposite edge. We include features to customize dot lifespan length, the reinsertion rule, as well as the number of dot sets to cycle through (with each set being presented in one frame), adapting procedures from established RDK versions in MATLAB . One primary concern in conducting visual psychophysical experiments on the web is that timing issues in the display could arise due to differences in internet connectivity speeds, monitor types (i.e., liquid crystal displays vs. cathode ray tubes), hardware, or web browsers used by participants. In testing our software, we have found that running the exact same code for our RDK in different browsers yields slightly different results. For example, we have identified small differences in the average frames per second when testing our RDK using Google Chrome, Firefox, and Safari on the same computer (Figure 1A). In a test of 10,000 presentations of the RDK in each browser, Chrome was the most consistent (mean: 16.632 milliseconds, sd: 0.364) in presenting the stimuli at the intended frame rate (16.667 milliseconds), followed by Firefox (mean: 17.217, sd: 0.898) and Safari (mean: 17.757, sd: 1.796). 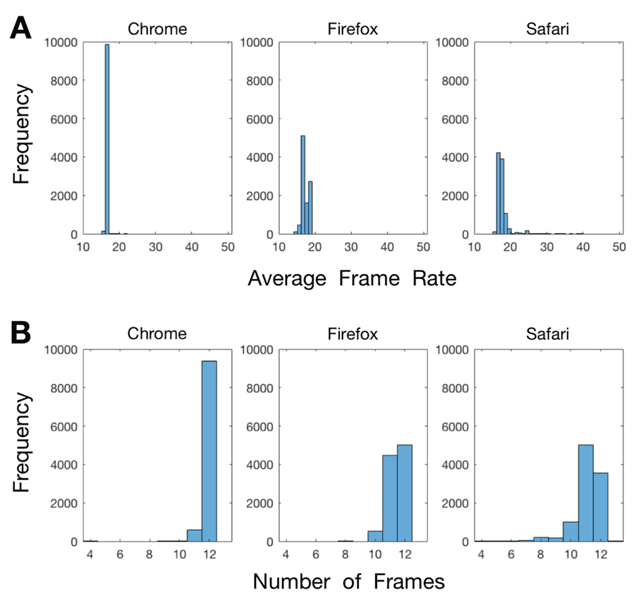 The average frame rate and number of frames shown per trial across three different web browsers. In this analysis, we presented our RDK 10,000 times in each web browser for 200 ms per presentation. Each panel shows the timing differences that emerge when displaying the stimulus on the same computer in the current versions of three different web browsers: Chrome, Firefox, and Safari. Each column denotes a different browser. (A) The average frame rate for each presentation of the stimulus. In these histograms, each bin is 1 ms wide and centered around the .667 mark (note that the ideal frame rate of a 60hz monitor is ~16.667 ms). (B) The number of frames that were used in each 200 ms stimulus presentation. The ideal number of frames is 12 using our monitor’s 60Hz refresh rate. What is needed to ensure accuracy and precision when conducting web-based psychophysics are not only real-time measures of the average frame rate of the display, but also the number of frames that are actually presented on each trial. Our RDK records the number of frames used in each presentation, which serves as a valid index of presentation clarity and coherence (Figure 1B). We recommend that users analyze this data in one of two ways: offline, to exclude particular trials from relevant analyses, or online, to re-present trials with missed frames to ensure balanced numbers of trials across conditions. In our tests of this stimulus, Chrome had the most consistent presentation (mean: 11.937, sd: 0.258), followed by Firefox (mean: 11.448, sd: 0.594) and Safari (mean: 11.136, sd: 0.902). We did not notice visible differences between trials when 11 or 12 frames were used, but a visible stutter was apparent when the number of frames was 10 or lower. Quality checks on other aspects of our stimulus (e.g., the locations where dots were re-drawn after disappearing, the number of dots drawn in the stimulus, whether the colors were rendered properly) demonstrated its viability, but we welcome feedback from users if issues arise. Finally, we also recommend that users give explicit instructions to subjects to only have one browser window open when participating in experiments with this stimulus and to close other programs while it is being used, as we have noticed slight timing idiosyncrasies that emerge when other browser tabs and programs are running in the background. This plugin is functional in the most recent versions of Safari, Firefox, and Chrome (i.e., the most up-to-date versions available for use in November, 2017). However, based on our tests, Chrome appears to be the most reliable browser in presenting an equal number of frames across trials for this stimulus. We welcome feedback from users if compatibility issues exist in older web browsers. The code for the RDK posted on CodePen works without any additional frameworks or libraries. The jsPsych RDK plugin requires the jsPsych library, jQuery, and a jsPsych CSS stylesheet to work properly. These scripts and links for the jsPsych version are added in the header of the main experiment file (see the identifier of (3) under ‘Software location’ below). Sivananda Rajananda – Development & Design. Brian Odegaard – Design & Code Review. Description: This CodePen link provides users with a visual demonstration of different stimulus attributes. By changing the RDK parameters, users can see (for example) how different signal & noise rules change the appearance of the stimulus. We recommend that users change values in the “Set Parameters” section of the code to visualize different features of this stimulus. Description: This link leads to our repository on GitHub with an example experiment that shows a functional implementation of our jsPsych-integrated RDK plugin. We think use of this stimulus in web-based experiments will be of particular value to researchers interested in studying populations that may be difficult to access (e.g., the elderly, individuals in various worldwide locations, individuals living far from testing sites, etc.). This RDK also facilitates fast and efficient data collection in motion perception experiments. In addition, researchers will be able to develop and extend our code under the GNU GPLv3 license to improve or modify the RDK to serve specific research purposes. We hope our creation here is of use to the greater vision science community and researchers interested in studying motion perception, and that efforts can be taken to adapt other types of visual psychophysical stimuli (Gabor patches, etc.) for web-based presentation as well. Britten, K H, Shadlen, M N, Newsome, W T and Movshon, J A 1992 The analysis of visual motion: a comparison of neuronal and psychophysical performance. J Neurosci, 12: 4745–4765. Available: https://www.ncbi.nlm.nih.gov/pubmed/1464765. Roitman, J D and Shadlen, M N 2002 Response of neurons in the lateral intraparietal area during a combined visual discrimination reaction time task. J Neurosci, 22: 9475–9489. Available: https://www.ncbi.nlm.nih.gov/pubmed/12417672. The MathWorks Inc. MATLAB. Natick, Massachusetts, United States. Available: https://www.mathworks.com/products/matlab.html.